At a glance, it's easy to think that this is a newer version of Sigma's 70-300mm f/4-5.6 APO DG Macro lens, but with an optical stabiliser fitted (OS). Sure enough, the Sigma 70-300mm f/4-5.6 DG OS is still a 'DG' lens designed for full-frame DSLRs and equally compatible with APS-C bodies that have smaller image sensors, but it's a completely different lens. Available in various mount options for Canon, Nikon, Pentax, Sigma and Sony bodies, the effective zoom range is 112-480mm on Canon APS-C cameras and 105-450mm in all other fitments. On current Pentax and Sony bodies, you get the choice of whether to use the Sigma's optical stabiliser or sensor-shift stabilisation featured in the camera. Using both stabilisers simultaneously can lead to problems and, in our tests, we've found the in-lens optical stabilisation works rather better, especially at long telephoto zoom settings. There's no HyperSonic Motor (HSM) autofocus actuator, the lens relying instead on a standard electric motor. By contrast, the OS is relatively high-tech and delivers a 4-stop advantage in beating camera-shake. 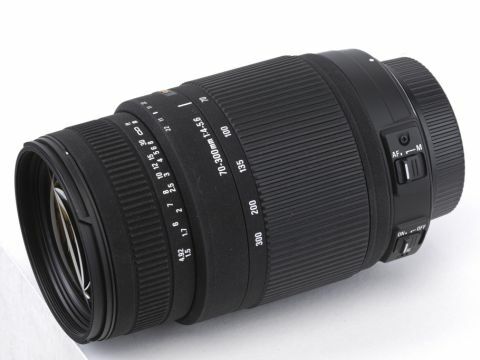 Unlike the cheaper Sigma 70-300mm APO, the Sigma 70-300mm f/4-5.6 DG OS lens features just one Special Low Dispersion (SLD) element rather than three. Overall, there are 16 elements built into 11 groups and a 9-blade diaphragm which enables an aperture range of f/4-5.6 to f/22-32. Another crucial difference is that this lens lacks the APO version's macro facility, the maximum magnification factor being 0.25x instead of 0.5x.